When I came into the office this morning, a lot of people said they heard incorrect information about the uniforms today. So, just to clarify a couple of things, I wanted to state the following: The “B” logo hat (which we all know and love), will be worn every time we don our home white primary uniform. It will also be worn every time we wear our new primary road jersey (seen below in gray). 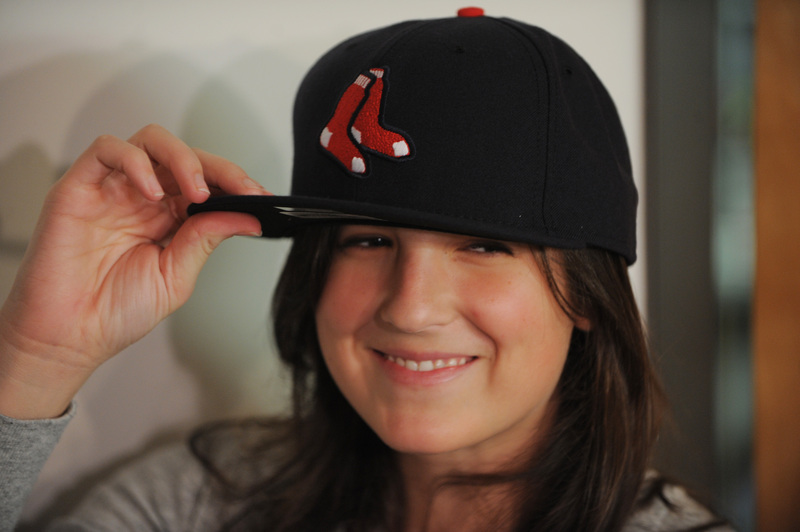 The hanging sox hat (modeled quite well below, by an unnamed member of the Front Office) will ONLY be worn as part of the alternate red and blue uniforms. At this point, I think I’m officially a registered expert in the field of Red Sox uniforms (I’ve been doing a lot of research on the topic today, so that I’ll know what I’m talking about). All the best from the Front Office! Thank you Insider for clarifying. I just got the nerve up to finally get the “B” tattoo on my arm, the same day the new uniforms were announced, so imagine my surprise had the “hanging sox” been deemed the primary logo… Oh well! Hey, nice post… this ting is new for me.. So I’m very excited to try this. Thanks for sharing Interesting post. Thanks for taking this opportunity to discuss this, I appreciate with this and I like learning about this subject. If possible, as you gain information, please update this blog with more information. I have found it really useful.